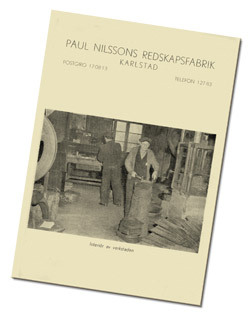 During fierce war (1st World War), Paul Nilsson’s Utility Factory was started at Klarälven Beach, Karlstad. Then begins the story of the company today Karlstad Redskap AB. Much has of course changed over the years but one thing can be said that the article number on one of the spades is still the same as it was then Article no. 11 Ay. The assortment consisted of spades, shovels, grabs and rakes. Fittings for the spades were developed and patented as “pipe fittings” and were still used as quality fittings. The distinguishing feature of the assortment was that they were stronger and more durable than other precious tools. The sales went to hardware stores and iron dealers all over Sweden, from Vilhelmina in the north to Ystad in the south. The factory eventually ended up in Inner Harbor in Karlstad (like Karlstad Spadfabrik), but a fierce fire extinguished in 1927 and was putting an end to the entire production, when the entire factory burned down to the ground. Fortunately, the thermal insecurity came about and a new and broader activity was built up ever since. We basically manufacture everything needed by hand tools for garden, park and road construction, and in recent times also for stables, both for professional work and for the wild garden. Karlstad Redskap AB, the company’s number, has developed and expanded the business over the years, therefore the premises became too small and the decision to build a new factory and moving the company to new, more custom premises was taken in 1970. The tools for the tools have changed over time, from To dig drain / cable dike to adjust for excavators. In the garden range, development work has mostly focused on ergonomics. Of course our users are of different lengths, but the tendency is for us to stay longer and longer, so we have also extended our tools over time. In addition, we have worked with different raw materials choices to reduce the weight. The assortment we have today has largely been created with our users. Through constant contact and good ideas, we have jointly developed a working tool range. At Karlstad Redskap AB, we continuously develop and process our various products. We always put the user’s needs at the center and want our raw materials choices to be solid and promote product and environment. It is with both feeling and pride as we deliver tools to our users. We can happily see the future.